The Zr-OxEPC is a residual oxygen analyzer for use with soldering ovens and similar applications where a process needs to be carried out in an oxygen free environment. Typically the process chamber is purged with an inert gas such as Nitrogen or Argon in order to remove atmospheric oxygen from the process area. The ZrOx use a sensitive zirconia sensor to detect residual oxygen down to the ppm levels. The sensor will not saturate which means it can be instantly responsive from high oxygen concentration such as atmospheric oxygen (20.9%) down to ppm levels in a matter of seconds. The instrument is self contained with a built in pump and sample lines ready to connect to the oven or glove box. Operation is achieved via a large touch screen user interface. 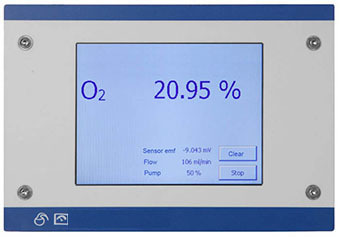 The current oxygen concentration is displayed in real time. Various digital and analog interface functions are possibly depending on the configuration of your system. There are built in alarms and relays that can be interfaced with your machine. There is an optional USB interface for data logging to a PC or PLC. Measuring range: 0.1ppm- 100.00 % O2. Sensor temperature: Approx. 800 °C. Heating up time: Minimum 15 min., optimal 40 min. Calibration: Recommended every 12 month minimum 1 calibration gas. Response time sensor Approx. 35 msec. Accuracy: +/-3 % 0-100,0% over 4 decades, smallest range to 0-1000 ppm. Gas sample flow: Approx. 100 ml/min,optional 0,5 to 10 l/min. User interface. 5.7'' Touch Screen Display (145 mm). Options: WEB interface for data communication. WEB interface for continuous data storage. Continuous, data stored inside analyzer. Displays alarms on the screen. Start the measurements via solder / packaging machine. Menu navigation in many languages. Interface RS-232, USB, LAN, 3 inputs for external signals. Options: Wi-Fi, RFID reader, barcode reader. Analyzer temperature, broken connections, system fault. Process alarms: 2x concentration alarms, 1x system alarm, flow alarm, all 3 alarms fully programmable. Analogue output: 2x 0/4 - 20 mA or 0 - 10 VDC, freely programmable. Power supply: 100-240 VAC / 47-63Hz. Dimensions: Height: 140 mm Width: 204 mm Depth: 310 mm. Ambient temperature: Operating: 0-50 degrees Celsius (no fan required). Ambient moisture : 95% absolute humidity non condensating.